How Much Do You Care For Your Best Friends? Now you can keep your dog healthy, happy and safe. Man's best friend likes the great outdoors and getting out to exercise is healthy. But it's usually illegal - and often dangerous - to let your dog run loose. There's always a danger from traffic or from mischievous children, not to mention the risk of a dog biting some passerby. Even a smart dog can't always tell friend from foe. A custom kennel will protect your dog from people and people from your dog. That way, everyone's happy - and safe. 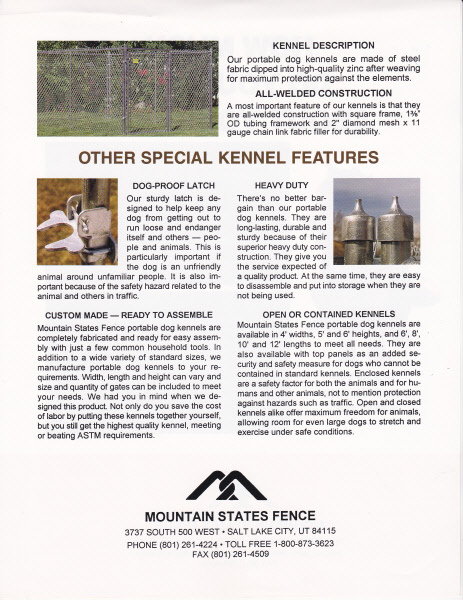 ​​Mountain States Fence portable dog kennels are available in a wide variety of standard sizes or they can be custom made to meet your specific requirements. Width, length and height can vary and size and quantity of gates can also be made to meet your needs. Zinc-coated steel chain link fabric. Residential chain link fence gates. Strength requirements of steel posts and rails & fence fittings. ​but the assurance of a quality product. 4' x 12' x 72"
8' x 12' x 72"